What to buy in Crete? Are you looking for something to bring back as a souvenir from your holiday? Below is a list of the products that are most popular with visitors to Crete. Olive oil is central to Greek and Cretan cooking and is also the most important agricultural product on the island. If you are going to buy olive oil to bring back to your country make sure that it is of the best Extra Virgin quality (why bother otherwise?) and if possible buy it in metal containers so that it won't break inside your suitcase. Though grapes have been grown and wine has been produced in Crete for 6000 years it's only in the very recent past that Crete has started to be known for producing high quality wines which would be also worth buying to bring back to your country. The best starting point for purchasing Cretan wines would be to go to a wine tasting such as is offered by the Douloufakis Winery near Heraklion. Honey is another important product of Crete. Here again, buy the best possible quality. Cretans consider thyme honey to be the best honey and it is also the most expensive. If at all possible buy your honey in a place where you can taste it, for example directly from a producer. If you can, buy it in plastic or metal containers to avoid breaking it on its way back. Raki is a spirit distilled from what is left over from pressing grapes, so in fact it is more or less the same as Italian Grappa. Most restaurants will offer you raki at the end of your meal and you might become quite fond of it. It's possible to buy it (the best stuff is generally sold very cheaply in recycled plastic water bottles) but beware: it will not taste as nice back home as it does here in Crete and will probably end up languishing at the back of a cupboard (maybe keeping company to other drinks brought back from past holidays). 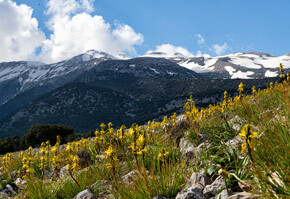 Crete has a wealth of wild herbs of the highest quality. They weigh next to nothing, don't break and are cheap so it's a good idea to stock up on thyme, rosemary, oregano and such. The Chania covered market has a few shops selling an excellent selection of herbs and spices. A number of shops sell high quality local beauty products made with natural ingredients such as olive oil, avocado and Cretan herbs and essential oils. 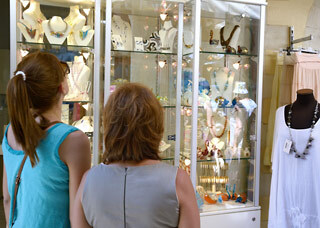 You can find a huge choice of good quality (as well as a large choice of less good quality) jewellery in silver and gold especially in Chania and Rethymnon. The intense competition can generate some good bargains. Crete has a very old tradition of pottery (over 5000 years really!) and there are many potters still practicing their skills on the island. The most famous place for pottery is the "potters village" of Margarites near Rethymnon but you can find potters as well as shops selling pottery in most places. There is a lot of mass-produced stuff but also some high quality and original work, all at very competitive prices. The most famous place for buying leather goods in Crete is without doubt Chania's "Leather Street". You can find some good bargain sandals, purses, belts and bags but little of it is of outstanding quality. Needlework is an old traditional craft fast getting replaced with mass-produced items. But you can still find hand-made embroidery and lace if you search for it. The komboloi or worry beads is a string of beads manipulated with one or two hands and used to pass time in Greek culture (fast getting replaced by mobile phones in younger generations). Unlike the similar prayer beads used in many religious traditions worry beads have no religious or ceremonial purpose. Komboloi can make nice souvenirs and presents. You can find them cheaply made of simple beads but there are also some serious antique collector items made from amber and other precious materials. With millions of olive trees growing in Crete it is no surprise that you will find shops selling items made of olive wood such as serving spoons, small bowls and small chopping boards. Anything a little larger will quickly command high prices as it is a lot more difficult to produce. Crete has a rich tradition of (religious) icons painting. You can buy them in shops but it is often more interesting (and quite a bit cheaper) to purchase them directly from an icon painter. Note that old icons may only be exported with special permission. Not so long ago almost every household had its loom but nowadays weaver have almost entirely disappeared. There is one very good shop in Chania (with Crete's only male weaver) as well as a few more shops in Axos and Anogeia (in central Crete, South of Rethymnon). Knives have a long tradition in Crete as pratical every day tools, weapons and ceremonial silver daggers. There are still quite a few traditional knife makers in the cities where you can purchase locally made knives (as well as a large selection of imported knives) for prices ranging from a few Euro to over a 1000 for the traditional Cretan silver daggers.